As today is my 60th birthday I thought I would celebrate by pondering one of those really fundamental questions, why do we in Britain drive on the left when so many of our continental brethren drive on the right? In the good old days there were only two ways of getting around – Shanks’ pony or on horseback. If you were a knight and were on horseback (and right-handed) you would want to ensure that your sword hand was unencumbered to enable you to defend yourself against attackers. It was also easier to get off your mount on the left, particularly if you had a sword in the way. This meant that horseriders naturally preferred to ride on the left hand side of the pathway, a practice which had been enshrined in legislation by 1300 by Pope Boniface VIII. Things became a bit more complicated around the 18th century when horse-drawn waggons were used to convey heavy loads, drawn by teams of horses. The driver didn’t have a seat but rode the left rear horse, leaving his right arm free to wield the whip. What it meant was that the driver sitting on the left, was happier if everyone passing him did so on the left. In other words, they adopted a preference for driving on the right hand side. What gave a real impetus to the driving on the right movement was the French revolution of 1789 and subsequent events. The French aristocracy had traditionally ridden on the left, forcing the peasants to travel on the right. When the sans culottes gained the ascendancy in 1789 they made driving on the right de rigueur. Napoleon’s rampages across Europe introduced the trend of driving on the right to many of our European friends. Naturally in Britain we eschewed everything that smacked of foreign ways and steadfastly stuck to our guns, ploughing our furrows on the left. The practice was enshrined in legislation here in 1835 and just as Boney had done, we introduced the custom of driving on the left to those parts of the world that had the good fortune to come under the yoke of enlightenment, otherwise known as the British empire. That is why some 35% of the world’s population including countries such as India, Australia and New Zealand and some African countries drive on the left to this day. Showing the laissez-faire for which we are famed some countries such as Egypt which moved from French to British control were allowed to retain their French customs. The Japanese, who were never British subjects, still drive on the left. This is due to their Samurai heritage – they too needed to have their sword hand free – but it wasn’t until 1872 that this unwritten custom became official, a year which coincided with the Brits helping the Japanese build their railways. It became enshrined in law in 1924. The Americans, of course, drive on the right. Initially, when it was a British colony the inhabitants drove on the left but following their rebellion in 1776 they eschewed all practices they associated with their colonial masters. Of course, the influx of settlers from European countries who had been subjected to the dread influence of the French also helped. The state of Pennsylvania was the first to pass legislation that required people to drive on the right (in 1792), followed by New York (1804) and New Jersey (1813). The answer then is due to knights, Napoleon and British perversity. So now we know! If you visit this neck of the woods and look carefully at the railings of the church named St Sepulchre without Newgate, you will see a rather nice marble water fountain, bearing the admonitory sign, “Replace the cup”. In 18th and 19th century London finding drinking water which would not imperil your health was a bit of a challenge. So dirty and polluted was the water supply that beer or gin was the safer option, although that custom brought with it other social malaises. After a series of cholera outbreaks in the early part of the 19th century the authorities decided something needed to be done to impose a greater degree of regulation on the nine companies who had sprung up to supply water to the populace of the metropolis. The Metropolis Water Act of 1852 made it illegal for water companies to obtain their domestic water supply from the tidal Thames, not least because that was where the sewerage companies deposited their untreated waste. Even though this piece of legislation was to improve matters, the problem was that the cost of clean water was beyond the purse of many of the indigent Londoners. This is where two philanthropists, Samuel Gurney and Edward Wakefield, stepped in, creating the wonderfully named Metropolitan Free Drinking Fountain Association. As its name suggests, its mission was to provide free drinking water to the masses. 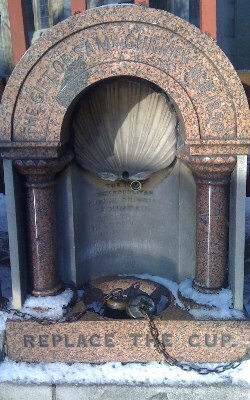 The first fountain that was built by the Association was that which can be seen in Snow Hill which still works and has two cups on a chain, or it did when I visited it. It opened on 21st April 1859 and was so popular that it was used by up to 7,000 people a day. It has remained in operation ever since, although it was temporarily relocated in 1867 and reinstated in 1913 when the Holborn Viaduct was being built. The Association built an additional 85 water fountains over the next six years, mainly funded by a combination of public donations and contributions from Gurney. The Association obtained royal imprimatur when Queen Victoria contributed towards the cost of a fountain in Esher. In 1867 the Association changed its name to the Metropolitan Drinking Fountain and Cattle Trough Association and turned its attention in conjunction with the RSPCA to matters of animal welfare. A number of water troughs were built for the use of horses, dogs and cattle and were common around the Smithfield market area and were also used to water the horses which drew the hackney carriages. Maps of the time were extended to show their location and they were known as filling stations. The Association is still going, although, as is the modern way, its name was abbreviated in 2011 to the Drinking Fountain Association. Next time you are in the area stop and look at this fascinating example of Victorian philanthropy. The water doesn’t taste bad either, but remember to replace the cup! So, according to our indiscreet PM, the Queen purred when he told her the result of the Scottish referendum vote. Of course, was it the Queen or had she realised who was calling on and so put a royal moggy on the line or was Cameron mistaken and it wasn’t a purr but the sound of gentle snoring? On the other hand, the Queen, like many of us down sarf, may just have been astonished by the result. After all, we are forever bumping into Scotsmen begging for change! As if those of us who tramp the streets of London don’t have enough to contend with, news reaches me this week of a pop-up restaurant that is trying to lure customers with a burger which is supposed to taste like and have the texture of human flesh. The product of the fevered imagination of a so-called freelance creative known for her macabre food concoctions and launched to coincide with the start of the fifth series of the TV show The Walking Dead, it seems a tasteless stunt on so many levels, even more tasteless than the normal burger. The question has to be asked – how do they know that it tastes like human flesh? And should we be worried if they have little flags with names written on them? What Is The Origin Of? (55)…. The two words under scrutiny today came into prominence during the First World War but owe their origin to the Indian sub-continent. This is used as an affectionate or ironic reference to Britain. It owes its origin to the Urdu word, vilayati, which was used to describe someone who was European and, specifically, English or British. A regional variation, bilayati, is probably the direct antecedent. The word was adopted by British soldiers serving in India during the 19th century to describe their far-off home, often in the form of dear old Blighty, but it was also used, as an 1886 dictionary of Anglo-Indian words shows, to describe products that the Brits had imported into the country such as tomatoes and soda water. However, its use took off during the First World War and was adopted both wistfully and ironically by the poets Wilfred Owen and Seigfried Sassoon to describe the homeland. 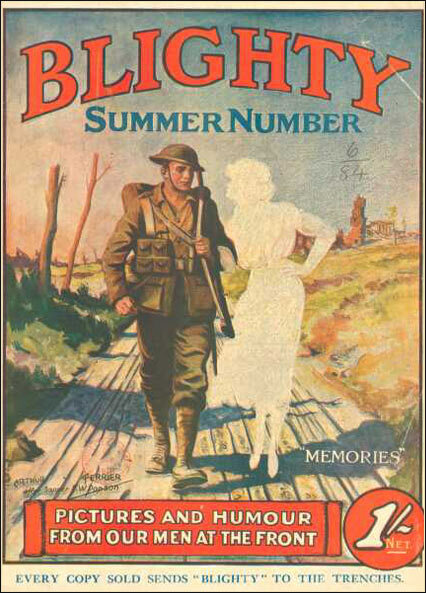 A humorous weekly magazine called Blighty was distributed to the troops during the War with contributions from men on active service and subsidised through donations and sales to the public. A Blighty wound was a self-inflicted wound designed to ensure a passage home and an escape from the horrors of the front. To have a dekko is to take a look. There are numerous ways of spelling the word and dekko seems to be the most commonly used. However, it is a misspelling of the Hindi origin of the word, dekho, which means to look. The word was adopted by the British during their time in India and was in use at least in the middle of the 19th century because Allen’s Indian Mail, a newspaper, of January 1856 contains the phrase, “The natives of the place flock round, with open mouths and straining eyes, to have a dekko”. Its usage spread like topsy during the First World War, although it had to jostle for pre-eminence with other idioms for having a look. Soldired, particularly from London or seeking to adopt a faux-Cockney accent would use, as alternatives, have a Captain Cook or have a butchers’, both of which are examples of rhyming slang, Cook rhyming with look and butchers’ requiring the listener to insert hook to get the rhyme. Another idiom for taking a look was to take a shufti. The origin of this phrase is the Arabic word, sufti, which means have you seen. Our notorious inability to speak another language and our magpie like habit of picking variants of words and phrases from other tongues and integrating them into English meant that this word, doubtless heard in the Middle East or Egypt, became part of the soldiers’ and, ultimately, our own vernacular. To have a gander, which is another variant of having a look, does not owe its origin to adoption from a foreign tongue. Rather it is a reference to the goose’s habit of stretching out its neck when it is looking for predators. Author frimleybloggerPosted on September 26, 2014 August 15, 2014 Categories History, HumourTags Blighty magazine, Blighty wound, dekko, have a gander, origin of Blighty, take a Butchers', vilayati2 Comments on What Is The Origin Of? (55)…. I have written before about the impact of the burgeoning obesity problem on everyday life, not least on our emergency services and the funeral business. With more than half the population of Britain fat or obese the waddling majority is in the ascendancy and making more and more demands on service providers and employers to make allowances for their bulk. In many cases this will involve the expenditure of large sums of money to provide facilities which might otherwise appear to be a waste (or is it waist?) of money. Employers in particular are holding their breath and considering the weighty implications of a case which is to go to the European Court of Justice. Karsten Kaltoft, a male Danish childminder (in many ways the Danes are an enlightened race), who weighed in at 25 stones or 160 kg, was sacked by his local council employer for being overweight – the proof of the pudding was his inability to bend down to tie up shoelaces – presumably his charge’s and not his, otherwise slip-ons would have been the answer. Kaltoft is alleging discrimination and the Advocate general, whose ruling is not binding but is generally followed, has thrown their weight behind the childminder’s claim. The repercussions are severe for employers if Kaltoft wins his case and the morbidly obese are classified as disabled. Even the seaside is under strain to accommodate the larger customer. We have had an unusually warm summer this year and there I s nothing better than a trip to the coast, a stroll along the sea front, a bag of chips or a pint of cockles, an ice cream and a nice relaxing hour or so parking your bum on a deckchair. But the standard sized deckchair doesn’t accommodate the more amply proportioned British rear anymore. I always find it vaguely amusing to see a deckchair collapse under the weight of someone or fold up in a way that prevents the occupant from getting out. Small things, but you have to get your pleasure where you can and where would Harry Hill get gainful employment otherwise at his age? If your living depends on the need and use of deckchairs, then you have to adopt a more enlightened approach to the issue. Southsea Deckchairs, who are the last independent manufacturers of deckchairs in England, report that they have had to add an extra inch to their previously 22 inch standard model to keep up with modern demands. They have also introduced a 36 inch model, called the Wideboy, which was originally designed for loving couples but is now flying out of the storerooms to meet the demand from the larger customer. I don’t think Solomon Rogers’ four-wheel, driveable double deckchair, complete with sound system, fridge, slushy drinks maker and parasol, and aimed at the sedentary holidaymaker is going to help matters any. Whatever next? We may as well wave the white flag! In the 1970s while we were having to endure the last thrashings of pompous and overblown prog rock bands such as Genesis and Yes and seeking solace in the adrenalin infusion that punk gave us, in Mali they were listening to two of the finest bands to come out of Western Africa, the Rail Band and Les Ambassadeurs du motel de Bamako. It is nothing short of scandalous that it was over a decade later and thanks to the pioneering work of DJs like the late lamented Charlie Gillett (who also introduced the world to Ian Dury) and the interest in what is euphemistically and patronisingly dubbed world music created by Paul Simon’s Graceland (albeit for South African music) before many of us were exposed to the wonderful music emanating from that part of the world. Dance bands were popular in Mali and Les Ambassadeurs was formed at the behest of the military junta to entertain favoured clients at the popular venue by the side of the Niger and under the shade of mango trees, the Motel De Bamako. Their style is an African take on Cuban music, mixing catchy Latin rhythms and tempos with native instruments and the ubiquitous guitar, one of the few positive influences from the mixing of African and Western soldiers during the Second World War. This album, a 2 CD set, sees Les Ambassadeurs in their pomp in the mid-1970s and features the wonderful soaring vocals of Salif Keita, whose 1987 breakthrough album, at least as far as Western audiences were concerned, Soro, still remains one of my all-time favourites. Salif, lured from their fierce rivals, the Rail Band, is in majestic and spine-chilling form. The balafon, played by Kaba Kante, a type of xylophone with hardwood slats and calabash resonators underneath, together with kora and keyboards features against a rhythm laid down by drums, including the talking drum, guitar and brass. The stand-out tracks are Mana Mana and Djandio. The vocals on Fatema are provided by Ousmane Dia on an arrangement featuring flute and violin and for sheer beauty you will go a long way to beat the stately Yassoumoukan which is a stately wedding song. The second CD features tracks from the vaults of Radio Mali. Not unsurprisingly the sound quality is a bit mixed but the verve and drive of the music shines through any technical imperfections. The band is a veritable Malian super-group. As well as Keita the album features the guitarists Kante Manfila and Amadou Bagayoko (he of Amadou and Miriam fame) with Idrissa Soumaoro on keyboards. In 1977 the band in reaction to the worsening economic and political climate in Mali moved to Abidjan and thence some headed to Paris. It was whilst in Abidjan that the band recorded perhaps their biggest international hit, Mandjou. A wonderful album and proof, if proof was needed, that here in the West we really did live in a hermetically sealed vacuum. It makes you wonder how much more wonderful music has passed us by.